The annual Leonid meteor shower could produce a strong outburst this weekend for residents of eastern North America and Western Europe. "We expect an outburst of more than 100 Leonids per hour," said Bill Cooke, the head of NASA's Meteoroid Environment Office. Cooke notes that the shooting stars during this peak period are likely to be faint, however, created by very small meteoroid grains. Elsewhere people will see the typically enjoyable Leonid display of a few meteors each hour, weather permitting and assuming dark skies away from city lights [Top 10 Leonids Facts]. The Leonids are bits of debris left behind by repeated passages through the inner solar system of the comet Tempel-Tuttle. Each November, Earth crosses various trails of debris, which have spread out over centuries and millennia. Dense debris trails have caused incredible meteor storms in years, past, notably 1998 through 2002 [Images from 2001: Gallery 1, 2, 3, 4]. Since then the show has been back to normal. But recent computer modeling suggests a brief outburst. "For parts of Europe, Africa and eastern North America, a far more prolific Leonid show could be in the offing this year," said Joe Rao, SPACE.com's Skywatching Columnist. This year is not expected to be as memorable as some but well worth a look, astronomers say. 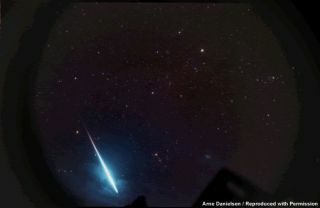 The Leonids are known for producing bright fireballs, which could occur at any time. The Leonids are so-named because they appear to emanate from Leo. The meteors can race across the sky in any direction, but trace each one back and it'll point to Leo. Unfortunately for viewers on the U.S. West Coast, the peak occurs before Leo rises. Outside of the expected peak, the best time to watch for Leonids is in the pre-dawn hours, when the constellation Leo is high in the sky. The Leonids are actually underway already, ramping up gradually to the peak. The event continues for several days after the peak. So any morning during this time could offer up a handful of meteors each hour. Other shooting stars from other sources typically grace the sky at low rates, too. Flurries of enhanced activity can come at any time. Cooke suggests taking a look in the pre-dawn hours Friday, Saturday and Sunday. Up to 10 shooting stars per hour are possible any of these mornings. A lounge chair or blanket and warm clothes are all you need [meteor watching tips]. Find a dark location with a clear view of the Eastern horizon. Lie back, face East, and scan as much of the sky as you can . You never know exactly where a Leonid will appear.